To access a map of our Kangaroo Wi-Fi Hopspot locations click here. No question advances in information technology have revolutionized how teachers help students in the classroom. But now it goes beyond the traditional four walls, outside what’s considered normal working hours, to help students late into the evening. In their quest to achieve “technology equity” for all students, Weatherford ISD - (WISD) has launched Kangaroo Wi-Fi Hopspots. WISD has created a safe place for students to extend the school day by extending Wi-Fi to its campus grounds from 4-10 pm on weekdays and 8 am – 10 pm on weekends. WISD is also partnering with local businesses to join them in the effort. “There are plenty of businesses in town that offer free guest wifi today. Then, there are those that would love to offer it but don’t have the technological expertise to do it,” said Executive Director of Technology, Cody Lee. But Lee said the school district had the solution. Lee said WISD is offering to go into businesses and hang an access point, provided the business has internet access, which more than likely they have. For a business that may not of seating for guest, Lee said an access point near the front of the business can still help students outside, perhaps near a grassy area or park. It’s estimated that upwards of 20 percent or greater of WISD students don’t have access to wifi, especially outside the city limits, said Charlotte Lagrone, Executive Director of Organizational Culture. 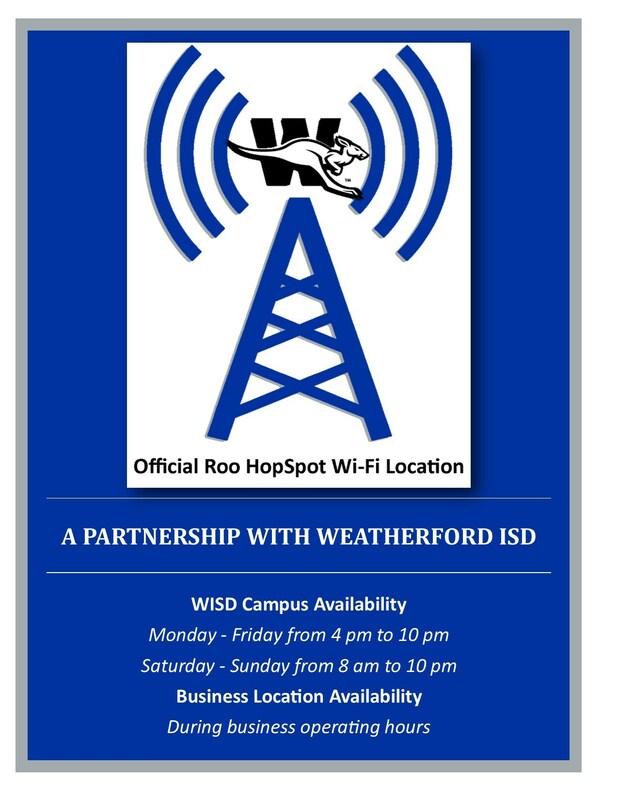 If you do not currently provide Wi-Fi at your business location, but would like to, Weatherford ISD invites you to join our Wi-Fi HopSpot network. The Weatherford ISD Technology Department can assist with the hardware needed. ▪ Your business will need to provide a broadband internet connection. ▪ WISD will provide the wireless access point to broadcast the WISD HopSpot network. ▪ We will send you a Roo HopSpot window cling (see below) for your business to display and also place your business name and location on the Wi-Fi map for students. If you currently provide free Wi-Fi to your customers and support students gathering in your business after school hours or on weekends, please let us know. We would love to add your business to our map of Wi-Fi hotspots. Hanks said the district knows a significant number of kids in WISD don’t have internet access at home. So WISD is trying to bridge the gap Hanks said . “It may be sitting outside one of the school campuses in their car, but at least student will have access to internet at no cost to them,” Hanks added.